Magnets do have a lot of utility in our lives. It has a lot of use of it in factories and decreases human effort by a huge margin. Magnets are the gift of nature which help our civilization to develop and reach new heights. NATURAL MAGNETS: These magnets are available in nature. 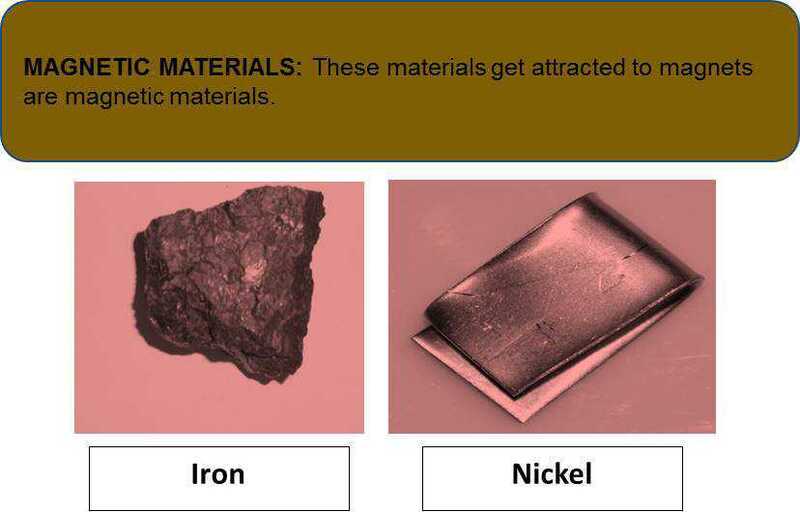 Example: Magnetite, Hematite and many any iron-containing rocks. 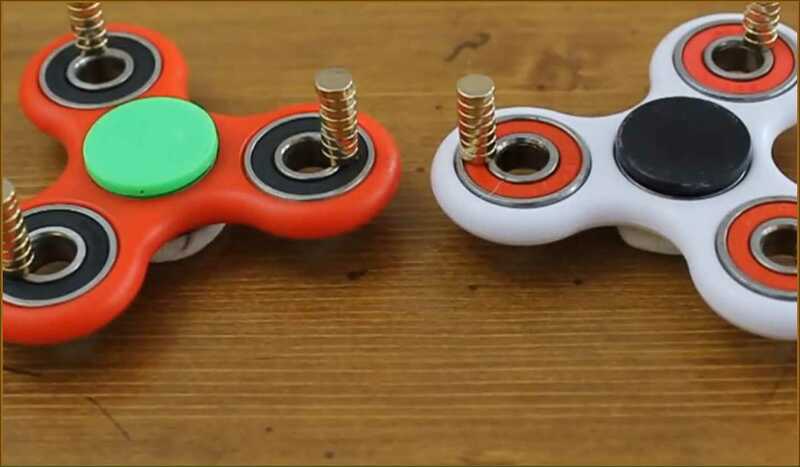 ARTIFICIAL MAGNETS: These magnets are not available in nature and made artificially by human beings. Example: Bar magnet, Horse-shoe magnet and the ball ended magnet. Suppose we keep many magnetic materials near a magnet. We will observe that most of the iron filings will be attracted towards the two ends of a bar magnet. These ends are addressed as the poles of the magnet. Then we can try and bring a few magnets of different shapes and check for the location of the poles on these magnets with the iron filings. Magnets have two poles- the North Pole and the South Pole. 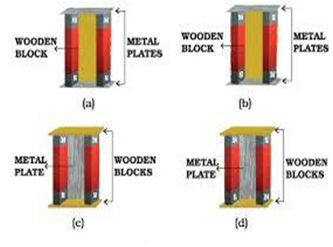 The magnetic substances are more attracted to the poles than the other parts of the magnet. We can get the directions of the compass with the help of the magnet. When we hang a magnet freely, its South Pole is always towards the Earth’s North Pole. We can make a magnet by rubbing it against a magnet. We can even make a magnet by putting an iron bar’s side near the poles of the magnet. We can even make a magnet by passing electricity through an iron bar. 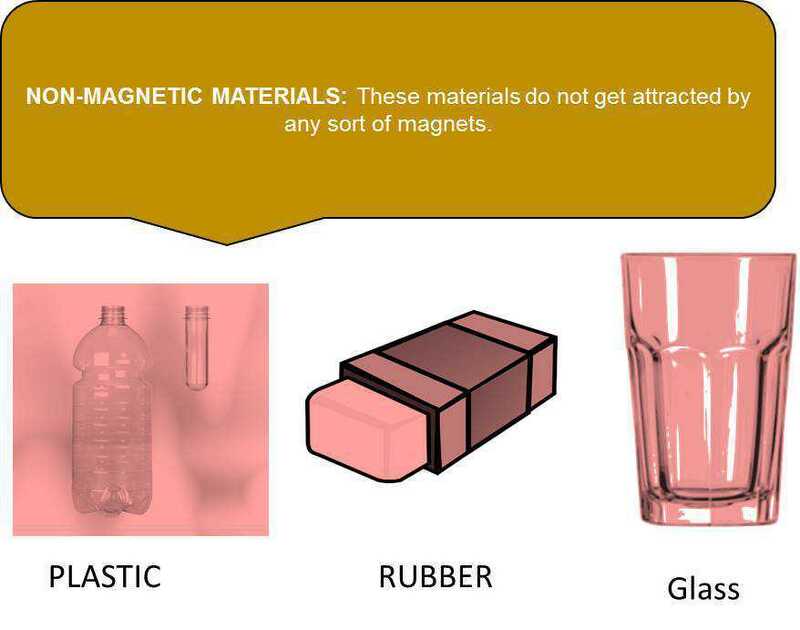 There are two types of magnets-natural and artificial. Natural magnets are those magnets which are available in nature. 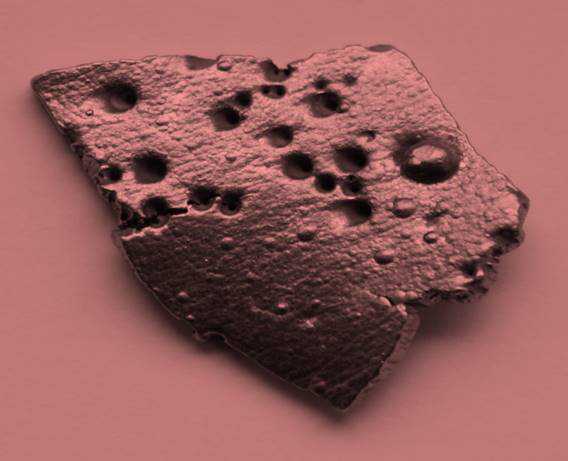 Artificial Magnets are those magnets which are made by human beings. Which of the following statement is correct for the above given picture? 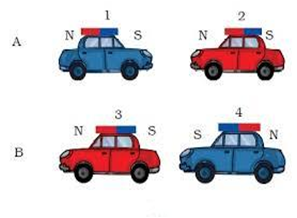 a) In A, cars 1 and 2 will come closer and in B, cars 3 and 4 will come closer. 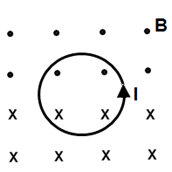 b) In A, cars 1 and 2 will move away from each other and in B, cars 3 and 4 will move away. 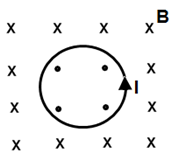 c) In A, cars 1 and 2 will move away and in B, 3 and 4 will come closer to each other. 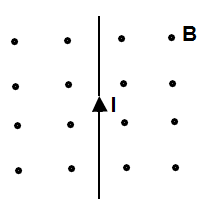 d) In A, cars 1 and 2 will come closer to each other and in B, 3 and 4 will move away from each other. 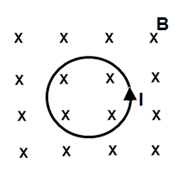 The arrangement to store two magnets is shown in figure (a), (b),(c) and (d). Which one of them is the correct arrangement? In a bar magnet, magnetic attraction is _____ near its ends. The North end of the freely suspended magnet points towards _________? Magnetism of a magnet is lost by doing which of the following acts? Electromagnets are prepared by the use of _____. When the current through an electromagnet reverses, the ______________________. Which of the following diagrams represent the magnetic field due to a circular current? 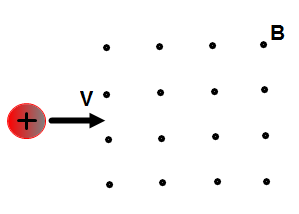 A positive charge moving with a constant velocity v enters a region of uniform magnetic field pointing out of the page. What is the direction of the magnetic force on the charge? A straight long wire carries an electric current to the top of the page. The current is placed in a uniform magnetic field directed out of the page. What is the direction of the magnetic force on the current? Sorting and Separation of Materials.. Living Organisms and their Surroundings..